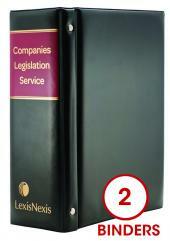 LexisNexis is proud to bring you another edition of this popular reference work on corporate governance. 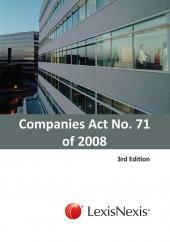 The book combines a detailed exposition of the governance requirements of the Companies Act of 2008 and Regulations, the JSE Listings Requirements and the brand new fourth King Report on Corporate Governance for South Africa (King IV) with over 30 recent case studies of corporate governance failures, from FIFA to Wells Fargo, the Libor scandal and The Panama Papers, used to illustrate the relevant governance principles in a clear, easy-to-read format. This third edition is probably the most practical of all of the editions of this book as the author includes pragmatic guidance on day-to-day issues that directors and boards often grapple with. With new chapters devoted entirely to the governance of state owned entities and listed companies and a series of practical appendices, this book will earn its place on the desks of many busy directors, company executives and students of corporate governance. The third edition of Ramani’s book arrives at a most appropriate moment amidst allegations of corporate misconduct, fraud and bribery. Corporate accountability can only become meaningful if boards of directors of companies embrace the tenets of corporate governance and thereby instill confidence in investors in particular and the public in general. If Broad Based Economic Empowerment is going to be realised, then corporate governance has to be combined with patriotism and ethical governance. On this consideration alone, Ramani’s comprehensive albeit not overpowering treatment of her subject makes this book a vade mecum. 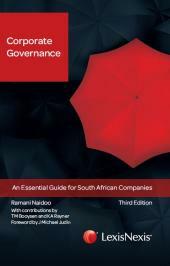 Like a good bottle of red wine, with the perfect balance and mix of aromas, backed up by its aging and resultant maturity, this third edition of Ramani Naidoo’s Corporate Governance speaks of no less. Its balance undoubtedly lies in solid theory and real practice. The reader will benefit from a richness of examples (aromas) and finish the book with a strong residual value. It’s a mature reflection of our times. This easy to read book is filled with insightful and practical application of principles of good governance. It should be welcomed. It should occupy a prominent space on any director or senior manager’s desk. Bravo! A most timely and highly recommended publication which no doubt will be the authoritative work on this subject for some years to come. Ramani’s outstanding book will become as essential to Corporate Governance practitioners as a GPS system is to the driver of a car on a journey which has many twists and turns. A remarkable exposition on corporate governance which is an essential read for those on boards of directors in civil society and the state.